Sentinel security fasteners can be fitted with standard pozi and phillips drive bits, but their unique designs means they can only be operated one-way, and cannot be undone. This makes them perfect for applications where the fastener will never need to be undone, such as outside council controlled areas. 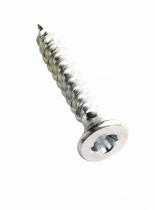 Our stock range of sentinel screws is limited to countersunk wood screws, but other fastener types are available on request.